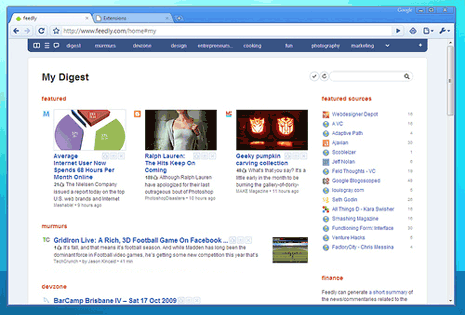 Feedly made quiet a buzz for being a fun magazine style RSS reader in the form of Firefox plugin. Well, this cool plugin is now available for Google Chrome users. You can neatly browse different RSS feeds content in fun and cool magazine ‘Feedly’ style. Feedly for Chrome is similar to Feedly plugin for Firefox (except for Gmail integration). Feedly blog explains simple procedure to get Feedly setup in your Google Chrome browser. 1. Download Google Chrome 4.0 dev channel (win, mac, linux 32bit). 3. Open [http://update.feedly.com/release/feedly.crx] to install Feedly. 4. Click on feedly icon on Chrome toolbar to load your feedly. Unlike few other Google Chrome plugins, this looks really polish and feature laden. So, if you have switched from Firefox to Google Chrome browser and missing Feedly – then grab Feedly for Chrome for fun and neat RSS reading! We need a Google account to use it, this is the only think I dislike.